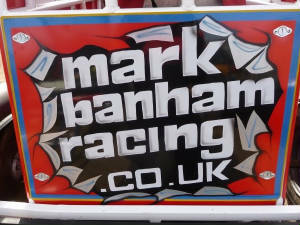 5 May 2006: Not put off by my efforts in the hire kart, I bought my kart from Dave Canham. Dave was sponsored by Sackers recycling who also sponsored the World Cup meeting and so the signwriting remained as a thank you. After having my number added on the aerofoil by Barry Keer my first meeting with my kart. I started at the back and did ok - spun into a tractor tyre in heat 1 and with no reverse that was the end of that race and was 10th and in the points in the Grand National before spinning into the same tractor tyre as in heat 1...DOH! Started off the back again and felt quick in the heats despite being boxed in by other drivers as I was finding my feet. Got away from the other drivers at the back early on in the final, found a good line and was flying - unfortunately the laps counted down a little too quickly! Started off the back again and found the track to be a bit bumpy but found a good line (most of the time!) by the final. A crash involving the leaders in the final improved my finishing position. My 6th in the final at Bovingdon promoted me to the Blue grade following the half year regrading and this is where I started. Due to heavy rain prior to the meeting, we were racing on the outside of the tarmac infield. This was an excellent meeting for me and I was on the pace all day. 5th in heat 2 beat my 6th in the final at Bovingdon as my best result. I was leading the Grand National for several laps until I spun exiting turn 2 with just under 5 laps to go...DOH! Due to additional time, Clare took part in a ladies race. Excellent meeting in front of an August Bank Holiday crowd at the Foxhall Stadium. The World Cup race was a bit damp which made conditions tricky. The heat race was my favourite race even though I was better placed in the final when I was much more on the pace. WORLD CUP: 9th, Heat: 10th, Final: 7th. Started at the back due to gain more shale experience and not a great day results wise! Heat 1, Heat 2 and British Championship: outside top 10. POINTS 0. Grand National: 10th. A bit of a nightmare on my debut at the Brandon Stadium. Very slippery and at least two spins did not help my cause! Enjoyed it none the less! Not a bad first season. Learnt a lot but need a lot more practice on shale.